Yamoussa Bangoura embodies, above all, a career rich in experiences, that of a multidisciplinary artist capable of showing his talents in varied fields: circus, song, music and dance. First there was the circus. His passion for acrobatics and aerial straps goes back to his childhood in Guinea. After touring for many years with big shows around the world (with the Circus Baobab, Cirque Éloize and Cavalia), he founded the Kalabanté circus company in Montréal, serving as artistic director. Kalabanté productions are at the origin of many humanitarian projects, initiating cultural exchanges between Canada and Guinea (the artist also founded a circus school in Guinea). And then there’s music.Yamoussa Bangoura sings wonderfully and has mastered the kora. He also gives dance and percussion classes. In 2014, he created his own musical group, Yamoussa Kora & Thousand Colors, with which he produced the album Afrique en cirque in 2017. His group explores Afro fusion, where Afrobeat, Afrojazz and reggae converge, in an energetic atmosphere influenced by Guinean sounds. In 2015, Yamoussa Kora & Thousand Colors won the Syli de bronze and, in 2016, the musician was the Syli d’or ambassador. 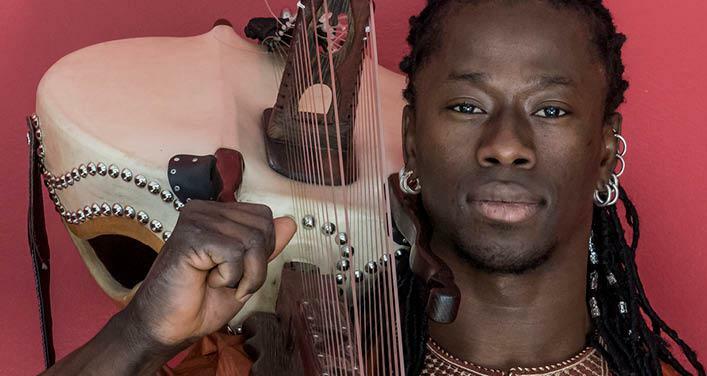 It will undeniably be quite the event to see Yamoussa Bangoura performing solo with his favourite instrument at the opening of the Nuit de la Kora!